On Sunday, Kenyans were very angry. Apparently , one of them was watching CNN , one of those stations only available on satellite dishes that require a monthly subscription. The Kenyan then posted a picture of CNN's coverage of grenade attacks in down-town Nairobi. 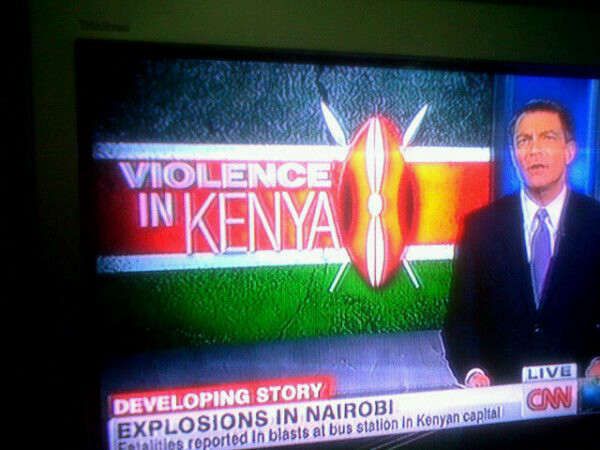 CNN , as a background of the news report, had an image of Kenya's flag, very big flame's and the word "violence" in Kenya. CNN was been sensationalist, trying to leverage on the image been a region as one prone by violence. By doing so, CNN was obviously out to increase its rankings by exaggeration the gory news that keeps their viewers glued to the screen, shaking their heads in disbelief, as they take bites out of cholesterol filled burgers. The Kenyans, whom most have not visited Country Bus Stations- where the attacks occurred - in a long while, were quite upset. You could see their anger as they took to their smartphones to tweet #SomeoneTellCNN , appending their messages to the hashtag. Their messages were in unsion, CNN should move from portraying the region as an uncivilised one where marauding, bare-chested dark natives roam the land armed with pangas. After all, it is just this week that YouTube's most watched video, depicted Kony , a Ugandan, as another marauding native who has set his target lower, scaring the hell out of children trying to attend school in Central Africa. Kony has not been sighted in the East African country of Uganda since 2006, but Americans(wait, South or North Americans?) are requested to help the makers of the film find the Invisible children. The concerned saviours will also pass by South Sudan, where they had previously posed with weapons from the Sudan's People Liberation Army. As the Kenyans kept tweeting their messages to CNN, they kept checking the Top Trending topics on Twitter, to see if they were shouting loud enough to top the world. It took a short while for them to trend, with someone quipping excitedly, "look, we are trending worldwide", with congratulatory messages being passed around. Another witty Kenyan on Twitter (KOT) quipped that Kenyan's were not only good in running, but good in trending - a great example that there was more than violence in this foresaken land of Africa, where diamonds have to be pulled our of blood and oil soaked earth. The angry Kenyans on Twitter even forgot to check what their media houses were reporting. The same image on CNN filled the screens of our local TV stations during news at 9, only without the "VIOLENCE" part. In fact, I can swear the flames on Kenyan TV were bigger. Almost an hour after the attacks, Kenyan media stations were still grappling with footage of a scene less than 2 kilometres from the CBD. It's the same stations that will cover political events , hundreds of kilometres from the CBD, live. One of the dailies even gave up with it's coverage, preferring to use Agence France-Presse (AFP) report of the blast in it's story. AFP, a news agency head quartered in France, was the first to have comprehensive coverage of grenade attacks 2 kilometres from Nairobi's CBD. Paris, the headquarters of France are 6,500 kilometres from Nairobi. Kenyan media is often filled with absurd political news, with "blow by blow" coverage of politician's every step, including the names they call each other, and the latest reports from a rally held in an non-descript location in Kenya's interior. TV news has the same political coverage dominating it's news. The problem, you would think, is Kenya's media. After all, the media won't even touch Nairobi Law's Monthly report on Julie Wards's suspected murderer. The Daily Nation, a Kenyan Daily, once gave politics a wide berth on it's headlines. Many people remember the issue, as so do the publishers. The Daily Nation received thousands of returns of the paper the following day, few people find the issue newsworthy. The day after the grenade attacks, The Daily Nation did not repeat the mistake. The grenade story fought for space with a story on Kenya's Prime Minister's comments that top politicians suspected of masterminding post election violence in the country should be behind bars. A country where people suspected of masterminding violence 4 years ago have never been questioned , a country which keeps mum on a murder committed 24 years ago, a country that values political remarks and exchange on their paper headlines, is appalled by CNN's usage of "VIOLENCE" on a new report on a grenade attack. Oh, and only six people died in the grenade attack.